Permits are issued and inspections are performed for most projects in order to ensure the safety of those who will be utilizing the new installations or occupying new or remodeled structures. Permit fees depend on the type of project. Permits must be paid for and issued prior to commencement of construction. Any individual contracted to perform work must be registered in their particular field, where registration is required (electrical, HVAC, plumbing, etc.). All contractors should check with the City of Dublin to determine whether registration is required for the work that they are performing. Apply for building permits at the Building Standards offices located at 5800 Shier Rings Road. Permit Forms may be obtained either at the office location or on-line. Fees will be assessed at the time that the permit is available for pick-up. Please inquire with Planning to determine whether zoning permits are also required for your project. Engineering will review the site plan. Please direct any questions to Engineering at 614.410.4614. Zoning will review the site plan. Please direct any Zoning questions to 614.410.4600. The Residential Plans Examiner will review the construction drawings for compliance with the Residential Code of Ohio as amended. Please direct structural questions to 614.410.4613. If a submittal is disapproved, the applicant will be notified by telephone and will receive a response letter, which includes comments from the reviewers. The applicant must pick up the disapproved submittal, make revisions and resubmit the project. Include the previously disapproved set in addition to the revised set. The applicant is notified when all approvals are granted. After the fees are paid and the permit is picked up, construction may begin. Approved plans, sign-off card and paperwork must be on site for all inspections.Separate permits are required for electric and plumbing. Underground Plumbing (plumbing inspections are scheduled by calling Franklin County Health Department at 614.462.3160. Final HVAC & Occupancy, inspector verifies that all other inspections have been completed. If there are further questions about inspections, please feel free to contact the inspectors from either 7:30 – 8:30 a.m. and 3:30 – 4:30 p.m. Monday-Friday at (614) 410-4670. If occupancy is not granted at the final occupancy inspection, it may be possible to obtain Conditional Occupancy. Conditional Occupancies are allowed when weather related items are the only outstanding issues and they are not considered hazardous to public health and/or safety. An application for Conditional Occupancy must be submitted to the Chief Building Official for approval. A fee will be assessed at $450 in accordance with the Dublin Codified Ordinances. A bond amount may be assessed based upon the work that is pending for completion. The Conditional Occupancy is not granted until the Chief Building Official approves it and signs the Conditional Occupancy Agreement. Please refer to “Conditional Occupancy” paperwork (available at the Permit Window) for additional information. The homeowner shall not move in until either Occupancy has been granted or a Conditional Occupancy has been issued. IF YOU HAVE FURTHER QUESTIONS ABOUT THESE PROCEDURES, PLEASE FEEL FREE TO CONTACT BUILDING STANDARDS AT 614.410.4670 FROM 8 A.M. – 4 P.M. MONDAY, TUESDAY, WEDNESDAY, AND FRIDAY AND 9:30 A.M. – 4 P.M. THURSDAY. *Homeowner Affidavit is required if a City of Dublin registered contractor is not performing all of the work. Approved plans, sign-off card and paperwork must be on site for all inspections.Separate permits are required for electric, HVAC and plumbing. If there are further questions about inspections, please feel free to contact the inspectors from either 7:30 – 8:30 a.m. and 3:30 – 4:30 p.m. Monday – Friday at 614.410.4670. Conditional Occupancies are allowed when weather related items are the only outstanding issues and they are not considered hazardous to public health and/or safety. An application for Conditional Occupancy must be submitted to the Chief Building Official for approval. A fee will be assessed at $300.00 in accordance with the Dublin Codified Ordinances. A bond amount may be assessed based upon the work that is pending for completion. IF THERE ARE FURTHER QUESTIONS ABOUT THESE PROCEDURES, PLEASE FEEL FREE TO CONTACT BUILDING STANDARDS AT 614.410.4670 FROM 8 A.M. – 4 P.M. MONDAY, TUESDAY, WEDNESDAY, AND FRIDAY AND 9:30 A.M. – 4 P.M. THURSDAY. Building permits are required for all construction work necessary to finish a basement. Electrical, plumbing and HVAC permits may also be required depending on the nature of the work which is being completed. When contractors are being hired to complete the work, please contact the City regarding Contractor Registration. If you, as the homeowner, are performing the work, a Homeowner’s Affidavit must be completed. Floor plan showing – layout of proposed rooms, w/dimensions and room use (include electrical and plumbing details and ceiling heights. A site plan is not required with a basement finish submittal. If the plans are approved, the permit will be prepared and the applicant will be contacted. The applicant may then pay the associated fees and the permit will be issued. Work may proceed once the permit has been paid for and issued. Building final & HVAC, when all work has been completed (including floor finishes) and electric and plumbing have been signed off; at this time the building inspector will issue a Certificate of Occupancy. Call 614-410-4680, inspections may be called in at any time, 24 hours a day. If the call is made before 6:00 a.m., the inspection will be conducted that same business day. This line is an automated system, please have the following information at hand when the call is placed; type of inspection, address where the inspection is to be conducted and permit number. Building inspectors will not enter a home when the owner or the owner’s representative is not in attendance. If a representative is only available at certain hours, please state this information along with a phone number so that the inspectors may call to confirm, if necessary. Inspections are generally conducted from 8:30 a.m. to 4 p.m., Monday through Friday (except Thursday, when inspections will be from 9:45 a.m. to 4 p.m.). The building inspectors are available from 7:30-8:30 a.m. and 3:30-4:30 p.m. daily to answer questions, by phoning 614.410.4670. When all work has been completed (including floor finishes) the building inspector will issue a Certificate of Occupancy. If you have further questions about these procedures, please contact Building Standards at 614.410.4670 from 8 a.m. – 4 p.m. Monday, Tuesday, Wednesday and Friday. 9:30 a.m. – 4 p.m. on Thursday. Building permits are required for all decks. The following information is required for a residential deck permit. Within the Deck Package are examples and preferred details to be used for a deck submittal. For a pre-submittal meeting with the plans examiner, call 614.410.4613. A site plan is a drawing or a survey that shows the property lines of a tract of property and all structures built upon it. The information must be drawn to scale. The reproduction process of sending a facsimile may change the scale of the drawing, thus these processes should be avoided. Please direct structural questions to 614.410.4613. All approved plans and paperwork must be on site for all inspections. Inspections are scheduled by calling the Automated Inspection Line at 614.410.4680 prior to 6 a.m. of the business day of the inspection. Inspectors are available to answer questions regarding inspections from 7:30 – 8:30 a.m. or 3:30 – 4:30 p.m. Monday through Friday by calling 614-410-4670. The Building Division Permit Staff is available to answer questions regarding these procedures by calling 614.410.4670. Building Division Office Hours are 8 a.m. – 4 p.m. Monday, Tuesday, Wednesday and Friday and 9:30 a.m. – 4 p.m. Thursday. The building inspector determines that all required inspections have been completed and approved and issues a Certificate of Occupancy. The Certificate of Zoning Plan Approval (CZPA) is used for all types of patios, storage sheds less than 200 square feet, pergolas or trellises unattached to the house, relocation of air conditioning units and any type of driveway configuration modifications. In order to apply and obtain approval for a CZPA, the applicant must include a full site plan that is drawn to an engineer’s scale (i.e. 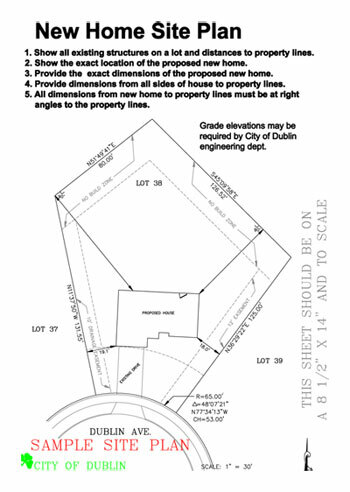 – 1″ = 20′), showing and labeling all property lines, building lines, easements, no build zones, etc. All existing structures need to be shown on the site, with the proposed work dimensioned and labeled, with the distances from the proposed work to all property lines shown and labeled. The approximate turnaround time for a Certificate of Zoning Plan Approval is from one to two weeks. The applicant will be notified by telephone upon completion of the review. Certificate of Zoning Plan Approval is required. Call Land Use and Long Range Planning at 614.410.4600 or stop by 5800 Shier-Rings Road from 8 a.m. to 5 p.m. weekdays for more information. Apply in person or fax the application to 614.410.4747. Zoning will review the site plan and structural plan. Please direct any Zoning questions to 614.410.4600. Approved plans, sign-off card and paperwork must be on site for all inspections. Separate permits are required for electric and plumbing. Footing – this inspection should be requested after the post holes are dug and /or footing forms are set and before the concrete is poured. Occupancy, inspector verifies that all other inspections have been completed. If there are further questions about inspections, please feel free to contact the inspectors from either 7:30-8:30 a.m. or 3:30–4:30 p.m. Monday-Friday at 614.410.4670. When all work has been completed, the building inspector will issue a Certificate of Occupancy. IF YOU HAVE FURTHER QUESTIONS ABOUT THESE PROCEDURES, PLEASE FEEL FREE TO CONTACT BUILDING STANDARDS AT 614-410-4670 FROM 8 A.M. – 4 P.M. MONDAY, TUESDAY, WEDNESDAY, AND FRIDAY AND 9:30 A.M. – 4 P.M. THURSDAY. Building permits are required for all residential swimming pools and pool barriers in the City of Dublin. The construction of all new residential swimming pools, pool barriers and the replacement, modification or maintenance of existing residential swimming pools and pool barriers is governed by two separate codes. The Residential Code of Ohio is a state building code that contains specific design requirements related to the use and construction of all residential swimming pools and pool barriers. The Dublin Zoning Code also contains specific information regarding the use, location and design of all residential swimming pools and pool barriers, a.k.a. “swimming pool fences.” However, the residential building code and the zoning code govern the design, installation and use of swimming pools and pool barriers from two different perspectives. The requirements of both codes must be met when designing a new swimming pool or barrier, replacing an existing swimming pool or pool barrier or effecting repairs to an existing pool barrier fence or wall. Two (2) Scaled and Dimensioned Site Plans – 8 1/2″ X 14″ or 11” X 17” site plans are preferred. Faxed copies of drawings and site plans are not accepted for review of building permit applications. Evidence of a current City of Dublin Contractor Registration. A signed Homeowner Affidavit form is acceptable provided a City of Dublin registered contractor is not performing work related to the swimming pool and pool barrier. Application Forms – The required building permit application form for a residential swimming pool or pool barrier is available at the permit window of Building Standards located at 5800 Shier Rings Road. Please contact a Residential Plans Examiner at (614) 410-4613 regarding any questions concerning the specific requirements of the building code. Please contact an Office Assistant at (614) 410-4670 if you have general questions related to the building permit application process. Building permit applications for swimming pools will not be accepted or approved without all required pool barrier information. The swimming pool contractor is responsible for the completion of the pool barrier. The proposed swimming pool design and dimensions – All drawings must be to scale and show all related dimensions). The proposed (or existing) pool barrier design – The barrier detail must include the barrier type/height/open space dimensions, access gates and any required door alarms. (See “New and Existing Swimming Pool Barriers” below) If an existing pool barrier is to remain the plans must identify any proposed modifications to the barrier that are associated with the proposed construction. Pool barrier details are required elements for all residential swimming pool building permit applications. Separate fence permits are not required for fences or walls used as swimming pool barriers. Building Permit Application Reviews – All building permit applications and construction drawings for swimming pools, pool barriers and hot tubs will be reviewed for compliance with the 2006 Residential Code of Ohio, the Dublin Zoning Code and all applicable civil engineering requirements. When the review is complete the applicant will be notified of the plan approval or disapproval by Building Standards by telephone. Disapproved plans must be picked up by the applicant, revised and resubmitted for review before a building permit application can be approved for a swimming pool or pool barrier. Plan Approval and Issuance of Building Permit – All required building permit fees must be paid in full when the approved building permit is issued. The stamped and approved building permit and construction drawings must be posted on-site before any construction can begin and must remain on-site through all phases of construction. Required Building Inspections – With the exception of plumbing, all inspections are scheduled by calling the Building Standards Automated Inspection Line at (614) 410-4680 prior to 6:00 a.m. of the business day of the inspection. All required plumbing inspections are scheduled by calling Franklin County at (614) 462-3865. An approved occupancy card must be obtained by the owner/contractor before a swimming pool can be filled with water. Final occupancy (and permission to fill and use the swimming pool) will not be approved unless the required pool barrier is complete. Please contact a Building Inspector at (614) 410-4670 with any questions related to required building inspections, final authorization to fill the swimming pool and receipt of the required Occupancy Card. Pool barriers are not to be located forward of any part of the residence or within a required side yard, rear yard, or other restricted area of the lot, such as a No Build Zone, No Disturb Zone, conservation zone, floodway, floodplain, drainage easement. Existing residential swimming pools that are nonconforming to the zoning code by reason of location and setback may be secured by means of a new open ornamental or solid fence (no more than four feet high) that is in addition to any pre-existing pool barrier located on the property. In this instance the new pool barrier may be located within a required building setback area, provided that the new pool barrier is located at least 10 feet from the existing pool barrier on the property and is no further than 10 feet from the edge of the existing swimming pool. Prohibited Types of Barrier Fences – Chain link, stockade and vinyl fences are not permitted. Pool barriers are to be “open ornamental fence ” or “solid fences” (as defined by the zoning code) If the pool barrier (“swimming pool fence”) requirements of the Dublin Zoning Code conflict with the requirements of any planned development zoning text, the more restrictive standard will apply. Pool barrier and fencing standards of the zoning code applicable to matters not covered in the planned development zoning text will apply. The required height for all new residential pool barriers is 4’-0 measured from the established grade line outside of the enclosed perimeter to the highest point of the barrier (including any posts and finials.) The height of the pool barrier fence or wall may not be artificially increased by the use of mounding. All openings, doorways and entrances are to have latches and permanent locks. Supporting members for fences used as pool barriers must be identical in appearance on both sides or be designed and located so that the structural members are not to be visible from the adjoining property. Existing Swimming Pool Barriers Installed April 2000 or Later – Existing swimming pool barriers legally installed in April 2000 or later are subject to the requirements of the zoning code. An existing swimming pool barrier legally installed after that date may be modified or replaced in its entirety with a new pool barrier of the same design material and location. The modified /replacement pool barrier must comply with all applicable requirements of the zoning code and all requirements of the current building code. Swimming Pool Barriers Installed Prior To April 2000 – Existing swimming pool barriers legally installed prior to April 2000 pre-date the requirements of the current zoning code. Qualifying pool barriers may be replaced with a new pool barrier of the same design in the same location. At the owner’s discretion, the replacement pool barrier may be replaced at the same height or a reduced height of no less than four feet (4’-0.) If the pool barrier to be replaced is made of a material that is currently prohibited by the zoning code (i.e. chain link, stockade and vinyl fencing, etc) the replacement pool barrier must be made of a currently permitted fence material. The design of the replacement pool barrier must comply with all applicable requirements of the building code. If any portion of the existing pool barrier is to be moved from its existing location, that portion of the replacement pool barrier must be brought into conformance with all of the requirements of the current zoning and building code. The corresponding site plan must confirm that the location of the existing pool barrier is to remain unchanged or must clearly identify the proposed location and setback of any part of the barrier that is to be relocated. Contact a Development Review Specialist at (614) 410-4600 regarding any proposed changes to an existing swimming pool barrier design or location. Depending on the scope of the work being performed, structural changes or alterations required for maintenance or repair of an existing pool barrier may trigger the need for a building permit. Contact Building Standards at 614.410.4670 for additional information or clarification regarding any planned maintenance of a pool barrier other than routine maintenance and minor repairs.